Combine the rub ingredients (salt, pepper, chile powder, cumin, coriander, cinnamon) together in a bowl and mix well. 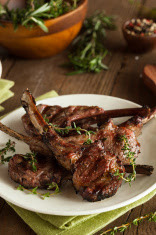 Rub all over the lamb shanks so that they are completely covered with the spice mixture. Remove from heat and once the meat has cooled slightly, enough for you to handle it, use a fork to pull the meat from the bone. 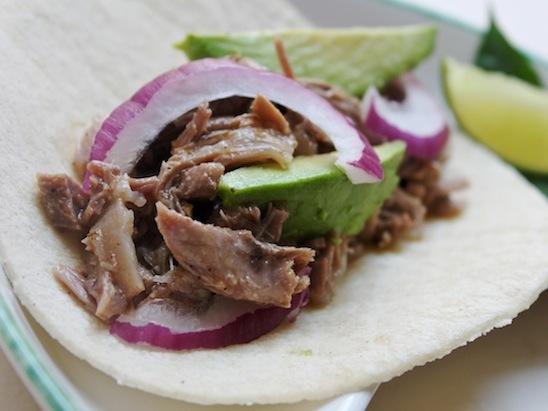 To serve, add some of the shredded lamb to a corn tortilla, top with a few slices of avocado, a couple pieces of sliced red onion, and a squeeze of lime juice. Boil water, add salt (heavy), cook potatoes until fork penetrates easily, but don't let them turn too soft (mushy potato salad is a fail). Drain, quarter and toss with 2/3 cup Kewpie mayonnaise, diced red onion and poblano. Toss in minced jalapeño (seeded or half-seeded if you're afraid of too much heat), ancho powder, and cilantro. Because your water was so heavily salted you likely won't have to add much salt, so just adjust as necessary. Touch of fresh ground black pepper. For the salad dressing it might be nice to roast the jalapeño. If you're going to do that stick it on kebab skewer and leave on the burner until charred, turn and repeat until all sides are blackened. Remove and put under a glass to remove skin. Purée the jalapeño with oil. Emulsify with vinegar. Adjust seasoning to taste. Dress with the watercress before serving. 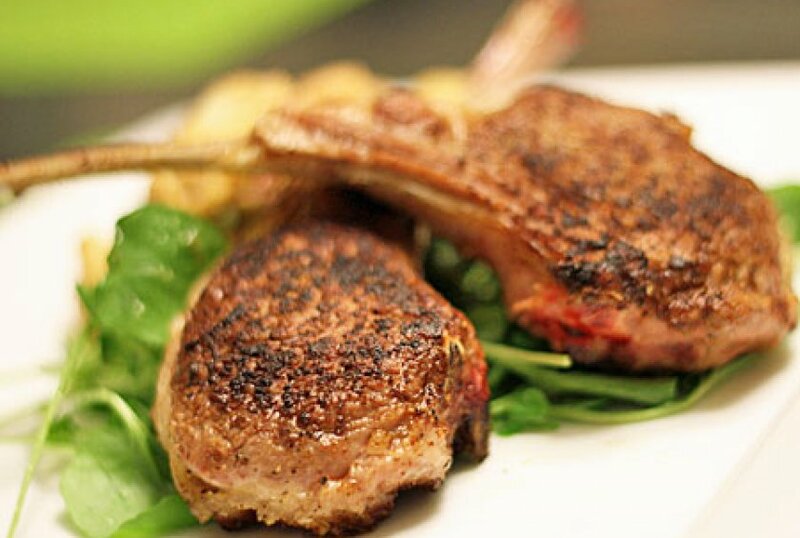 Cut the rack to create individual rib chops. Pat dry and rub with salt, pepper, and ancho powder. Get the pan hot, add oil, and butter then sear the chops, ladling butter and oil from the pan over the rib chops as they cook. Turn for a minute. Dress the watercress, and serve with a scoop of potato salad on top of the salad. In a large saucepan, heat the coconut oil over high heat. Once melted, add the rice and sauté for about 30 seconds. Add the water and a pinch of salt and bring to a boil. Once boiling, reduce the heat to a simmer and cover. Cook the rice until tender, about 45 minutes, checking water levels and stirring every so often so rice doesn't stick. Meanwhile, heat a large sauté pan over high heat and add the olive oil. Add the broccoli and sauté until it is bright green and tender (you might need to add a bit of water if your broccoli is not super-fresh). Set aside. In the same pan, add a bit more olive oil and then the lamb. Season lightly and sauté until just cooked through, about 3-5 minutes. Season to taste with paprika, if desired. 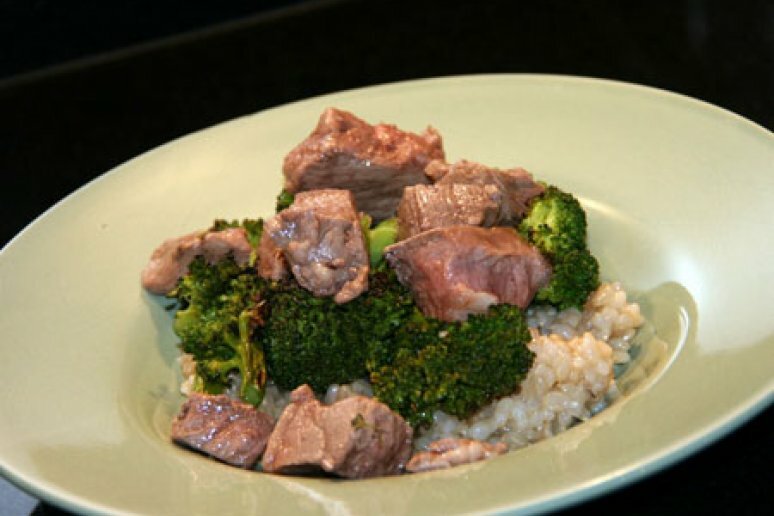 Serve a large spoonful of rice on each plate and add the broccoli on top. Garnish with the lamb and serve with soy sauce and/or cheese, if desired. 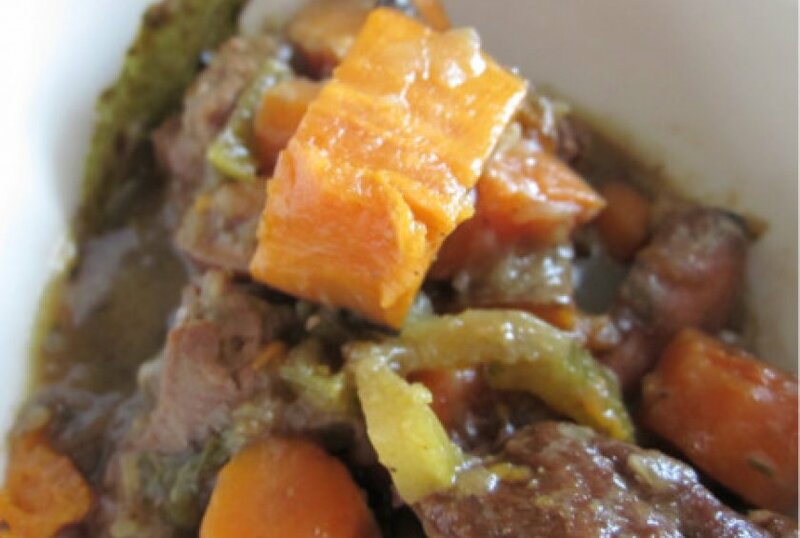 Leave the meat out for approximately 10-15 minutes if removing directly from the refrigerator. This will help ensure even cooking. Season with salt and pepper. Meanwhile, heat the oil over high heat in a 6-8 quart stockpot until almost smoking. Add the cubes of meat, making sure not to crowd the pan. Do not move the meat for several minutes in order to allow a crust to form. With a pair of tongs, turn each piece of meat over to brown the other side. Allow to cook for several minutes, and then remove the meat to a bowl and reserve. To the fat in the pot, add the onion, carrot, and celery. Lower the heat to medium-low and allow to sweat for 10 minutes, or until the onions are caramelized. Using a wooden spoon, scrape up all the brown bits at the bottom of the pot. Season with salt and pepper. Stir occasionally. Add the meat back into the pot along with any accumulated juices. Add the chicken stock and bring to a simmer. Add the bay leaf and thyme and simmer gently for about 1 hour. Add the sweet potatoes. Taste and adjust seasoning if necessary. Cook for another 25-30 minutes or until the sweet potatoes are tender. Serve immediately. Wash and pat dry the lamb. Make ½-inch slits on both sides of the lamb. Then generously rub with olive oil, salt, and pepper. Then take the slices of garlic and place inside the slits. In a bowl, grate the remaining garlic to a paste using a Microplane or on a cutting board with a chefs knife. Then add the rosemary and sage; mix to combine. Rub the mixture over the lamb and inside the slits. Place the lamb on a baking tray, fat side up; cover and place in the refrigerator for 4 hours or overnight. Remove the lamb from the refrigerator 1 hour before cooking it. Preheat the oven to 450 degrees. 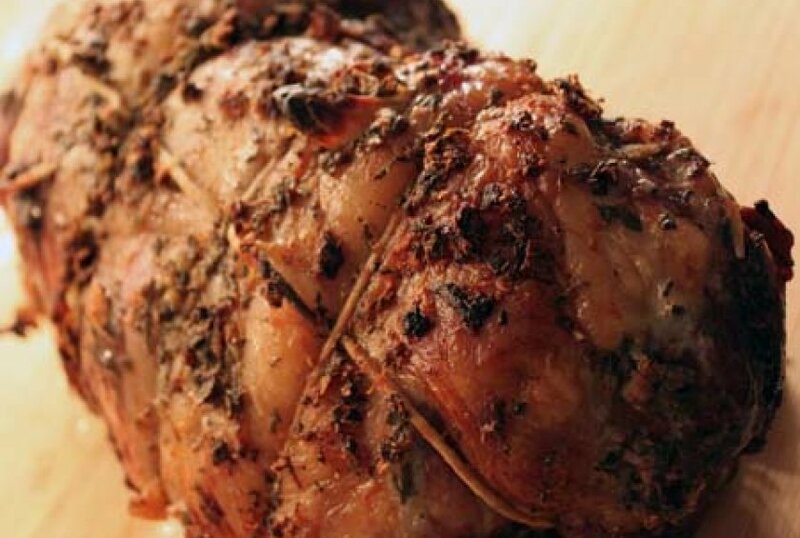 Place the lamb on a baking pan, using a roasting rack if you have one, and cook for 10 minutes. Then lower the heat to 350 and cook for about 1 hour and 50 minutes or until a meat thermometer reaches 135 degrees at the thickest point for medium rare. Continue to cook if you like your meat done more. Remove from the oven and allow to rest for 20 minutes. Carve and enjoy.